Allot has changed in the LWUIT Designer in the last few months, the changes might not be immediately obvious in the new drop at first glance but those who have been using the tool for quite a while should look forward to one of the strongest releases yet. 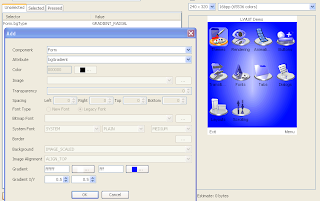 A public beta of the LWUIT Designer now be tested via Java Web Start by clicking here, we intend to update the JWS version more regularly than we do the LWUIT released in the future. This in itself is a huge improvement since it will allow the LWUIT designer to track current LWUIT development closely. So what is new? Too much to mention but I'll try to give out some highlights. We now have a new resource file format (which is documented within our drops docs directory), this will require modification to existing resource files and recreation of fonts however the benefits are huge! Export to Ant script - includes generating the files representing the entries within the resource file. This was often requested, however impossible with the previous file format. When adding images to the resource editor they won't be reencoded as PNG anymore, this will allow you to shrink your images with existing tools or even use JPEG's. A major animation bug was fixed, this should now reduce the size of animated GIF's considerably (they should be added again to see the difference). The Selected/Unselected/Pressed styles allow simplified and far more powerful themeing of LWUIT code. Gradient background support allows for very powerful UI's without much overhead. Memory overhead estimate provides some ballpark figure regarding the amount of RAM a given theme should occupy for the current screen. Fonts are now far more elaborate and easier to manipulate. They should work better on additional platforms as well and you can disable bitmap fonts on a specific platform by using a boolean flag in Font. Image alignment and background type behavior allow further background customization. For the next drop we plan to add SVG support that will allow keeping a bitmap fallback for every image thus provide full portability for devices with weak/problematic SVG support with a single binary. where can I download the drop that include this improvements? How is the perspective to include this great tool in NetBeans ? Looking forward to get the new code drop! I've been using LWUIT since it's "birth" and I believe that without it I would already given up on JME! So thank you for your progressive and tireless effort to make this toolkit better! I would only like for better documentation(I know how hard this can be), examples of rich UI's (like themes that mimic iPhone UI, maybe with 9-slice borders or so), and lastly to see the Matisse Editor launched as an integrated part of NB or as a plugin. You won't find those JAR files easily, since i've been in that path before. What you can do is compile the JAR's yourself. The source code is at https://meapplicationdevelopers.dev.java.net/source/browse/meapplicationdevelopers/demobox/ where you have various examples, demos and libraries. If you need any help...send me a mail!